Cut or break stems off mushrooms. In a large bowl, whisk together the mustard, rosemary, steak seasoning and water. Place the mushroom caps in the bowl and toss with the sauce, using your hands to evenly coat. Let marinate for 20 minutes. Heat the grill to medium heat. When hot, brush the grate with avocado oil. Place the mushrooms on the grill, reserving any leftover marinade for basting. Grill for 5-7 minutes per side, or until tender, brushing with marinade frequently. Top the mushrooms with cheese the last 2 minutes of cooking. Grill the onions about 1 minute on each side and grill the buns until toasted. 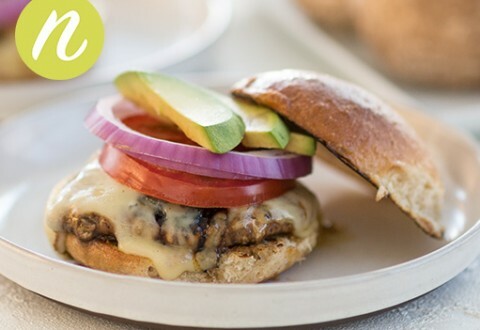 To serve, place arugula on each bun with the grilled portobello mushroom on top. Top with onion, tomato and avocado.